The future of work is usually discussed in theoretical terms. Reports and opinion pieces cover the full spectrum of opinion, from the dystopian landscape that leaves millions unemployed, to new opportunities for social and economic mobility that could transform society for the better. The World Economic Forum’s The Future of Jobs 2018 aims to base this debate on facts rather than speculation. By tracking the acceleration of technological change as it gives rise to new job roles, occupations and industries, the report evaluates the changing contours of work in the Fourth Industrial Revolution. One of the primary drivers of change identified is the role of emerging technologies, such as artificial intelligence (AI) and automation. The report seeks to shed more light on the role of new technologies in the labour market, and to bring more clarity to the debate about how AI could both create and limit economic opportunity. With 575 million members globally, LinkedIn’s platform provides a unique vantage point into global labour-market developments, enabling us to support the Forum's examination of the trends that will shape the future of work. Our analysis uncovered two concurrent trends: the continued rise of tech jobs and skills, and, in parallel, a growth in what we call “human-centric” jobs and skills. That is, those that depend on intrinsically human qualities. Tech jobs like software engineers and data analysts, along with technical skills such as cloud computing, mobile application development, software testing and AI, are on the rise in most industries and across all regions. 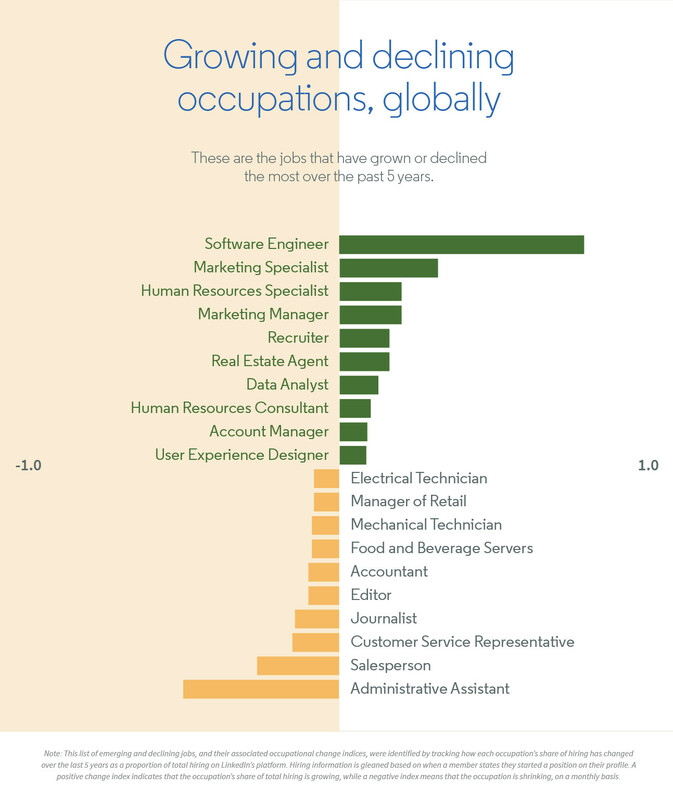 But a number of highly “automatable” jobs fall into the top 10 most declining occupations - ie, jobs that have seen the largest decreases in share of hiring over the past five years. These occupations include administrative assistants, customer service representatives, accountants and electrical/mechanical technicians, many of which depend on more repetitive tasks. 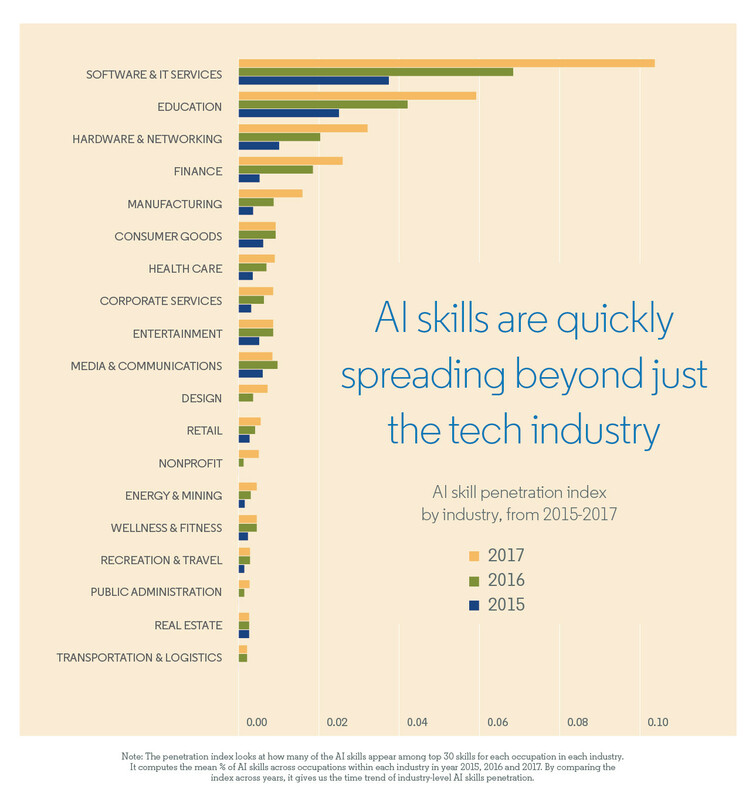 ● AI skills are among the fastest-growing skills on LinkedIn, and saw a 190% increase from 2015 to 2017. When we talk about “AI skills”, we’re referring to the skills needed to create artificial intelligence technologies, which include expertise in areas like neural networks, deep learning and machine learning, as well as actual “tools” such as Weka and Scikit-Learn. LinkedIn data shows that all types of technical AI skills are growing at a rapid pace around the world. 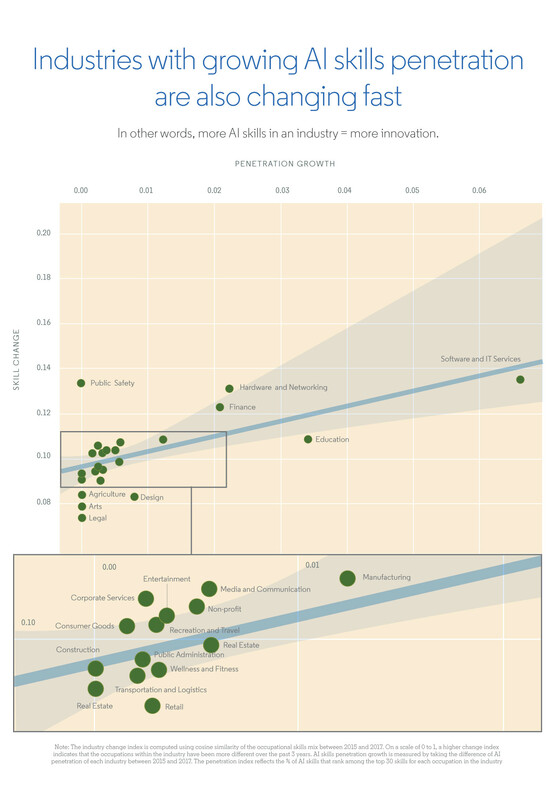 ● While we see AI skills growing in every industry, our data also shows that industries with more AI skills present among their workforce are also the fastest-changing industries. If we consider “change” to be a proxy for innovation, then this indicates that the presence of AI skills correlates strongly with innovation within an industry. It also means there’s an opportunity for many industries to invest more heavily in their AI capabilities. 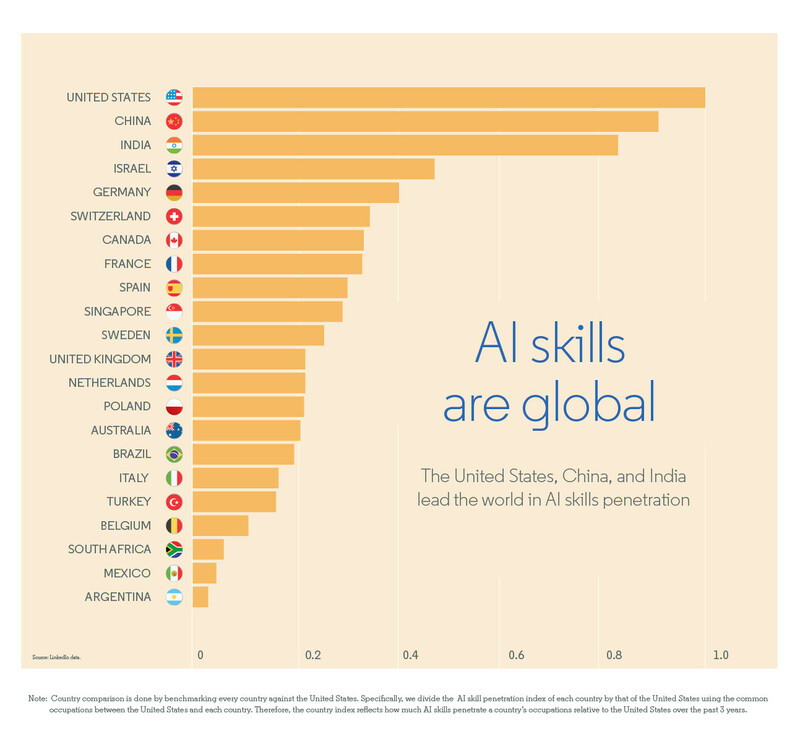 ● AI skills are global, and the countries with the highest penetration of AI skills are the United States, China, India, Israel and Germany. What if AI is coming for jobs faster than we thought? As the recent report makes clear, the anticipated impact of AI on the labour market fits neither of the polarized narratives that tend to hog headlines. It's estimated that by 2025, the amount of work done by machines will jump from 29% to more than 50% - but that this rapid shift will be accompanied by new labour-market demands that may result in more, rather than fewer, jobs. As the report notes, these predictions “[provide] grounds for both optimism and caution”. While AI is unlikely to replace human workers, uncertainty remains regarding what types of jobs will be created, how permanent they will be, and what kind of training they may require. Preparing the workforce for these changes will depend on a data-driven approach to understanding the trends that are shaping the future of the labour market, and a commitment to investing in lifelong learning opportunities that can help workers adapt to rapid economic shifts. As the world continues to invest in AI technologies, we’ll continue to assess their externalities and impact on the workforce, especially as they connect to opportunities for more effective reskilling and education initiatives. As new skills emerge, governments, educational institutions and employers should consider how they can most effectively develop learning programmes that equip people with the skills they will need to keep up with the modern economy.